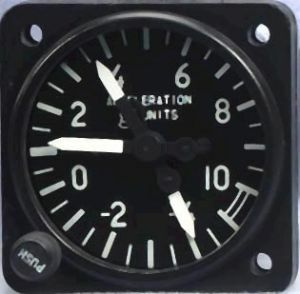 This instrument can detect and report g acceleration acting on th aircraft structure, during normal or aerobatic manoevres, and turbulent flight. With three pointers, one will give continous indications, two will read max. and min. postive and negaive G acceleration. easy to read, easy to reset thank to its central knob. All are mechanical models, granting precision, accuracy, and long lasting. No power necessary, therefore no cabling. Wheter you'll go aerobatic or not, this G-Meter will be your valuable support. Big instrument, small price.